In October, worried over the red marks in airline balance sheets, top officials of the government summoned airline bosses. Junk the price war and make some money, was the advice given. It was a rare demand from the government, which has portrayed exponential growth in air passengers as an achievement. “Excessive competition has led to decline in tariffs (rates), affecting GST (goods and services tax) collections from the telecom and airline industries,” Finance Minister Arun Jaitley said in a recent interview. The airlines did try. Faced with fuel prices creeping up, they thought festival time was the ideal moment when they could earn some more — they raised fares by around eight per cent. They have been proved wrong. The data suggests Indian flyers are now used to a low-fare environment. Passenger traffic numbers show their growth has come at the expense of unrealistically low yields. Airlines' worry is that even on routes where there are people with high disposable incomes, the only way to generate enough demand seems to be to cut prices. 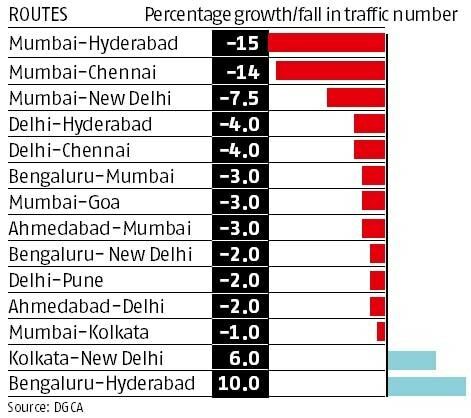 Data from the Directorate General of Civil Aviation (DGCA) shows the number of passengers fell on 12 of the top 15 routes in the peak traffic season of November. 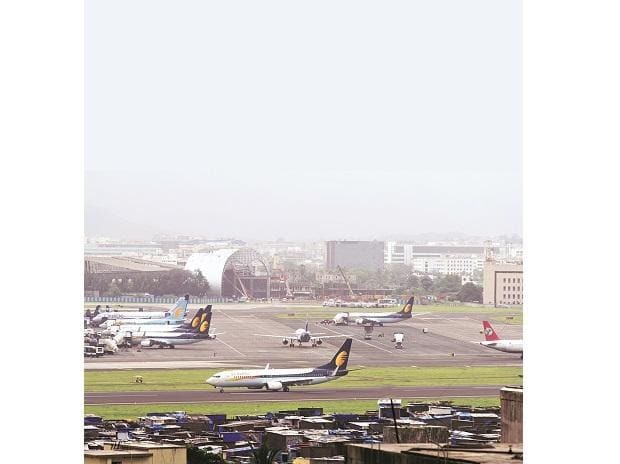 When compared with October, passenger growth decelerated by almost eight per cent on Mumbai-Delhi, by 14 per cent on Mumbai-Chennai and by 15 per cent on Mumbai-Hyderabad. “Airlines in India have been unable to commoditise air travel. Leisure travel is clearly being driven by low fares in most cases. If last-minute prices are firmed up, passengers complain and if they are not, airlines are at a loss. The trick will be to find a balance, of managing fares without losing the demand,” said Ameya Joshi, founder of aviation blog Network Thoughts. Kiran Koteshwar, chief financial officer at SpiceJet, says: "In a market like India, there is a cap beyond which airlines will not be able to increase price. Hence, it is important to keep costs in control." Some suggest the fall in passenger numbers is in fact a positive sign, suggesting airlines are willing to sacrifice “unrealistic growth” in favour of more revenue. “Personally I don’t worry too much about the fall. I am more focused on what average fare gets us to profit. Growth at 10 per cent is also good if it brings higher revenue,” said an executive of a low-cost airline. So, what is the 'sweet spot' for airlines? Where they can recover costs but not lose passengers? An executive of a full-service airline suggests in the current cost environment, the ideal ticket price between Delhi and Mumbai should be at least ~6,000. But, that it will be impossible for airlines to command such fares with the level of capacity being added. “Equilibrium will be difficult to achieve. All airlines adding capacity will not want them to fly empty. The only way to simulate demand is through low fares. Peak season is still okay. But, in the weak season, all carriers say ‘I’d rather add capacity and try to steal share than support a fare increase across the industry',” he says. According to an estimate by brokerage firm ICICI Securities, Indian airlines will add around 120 aircraft by 2019-20. Joshi of Network Thoughts suggests airlines not bother about the fall in passenger numbers. “Having fewer seats filled at higher revenue could be helpful for quicker turnarounds and having additional cargo space, which is more profitable. The objective is profitability at thenunit level and never load factor,” he avers.